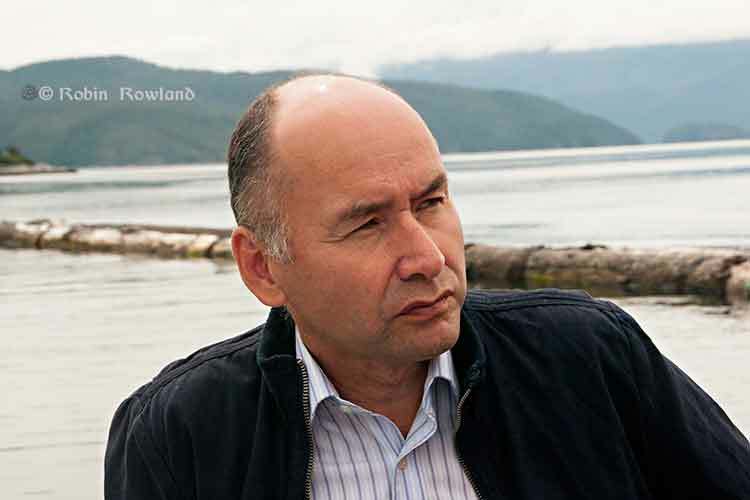 The Haisla Nation have filed an application with the National Energy Board for their own liquified natural gas export project, according to industry newsletters. There is nothing at this point in the public section of the NEB website, probably due to the holiday weekend. Northwest Coast Energy News is contacting Haisla leaders for confirmation. 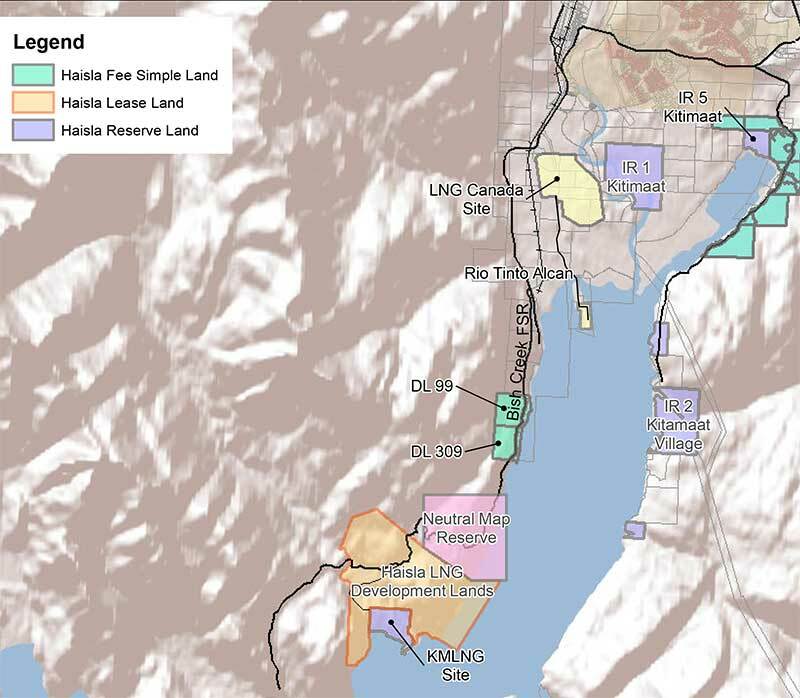 According to both the Daily Oil Bulletin and Natural Gas Intelligence the Haisla have formed three companies, Cedar 1 LNG Export, Cedar 2 LNG Export and Cedar 3 LNG Export, and have applied to the NEB for three standard 25 year export licences. The plan calls for a mini-armada of six mobile processing plants, with each one capable of converting up to 400 MMcf/d of gas into liquid cargo for overseas deliveries. Work is under way with international tanker firm Golar LNG to commission construction of the vessels in Singapore at the Keppel Shipyard, according to the applications. With the project still in planning stages, Cedar LNG did not disclose cost estimates. Names of prospective partners in the terminals; Asian customers, BC gas suppliers and pipeline service providers were also undisclosed. Discussions are under way on all fronts with an array of industry participants, Cedar told the NEB. 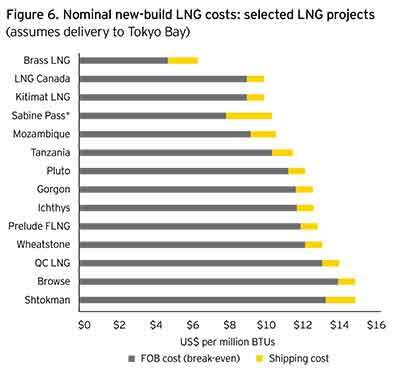 The Hasila are partners in the stalled BC LNG project that ran into trouble when the original Texas based investors got into financial difficulty. 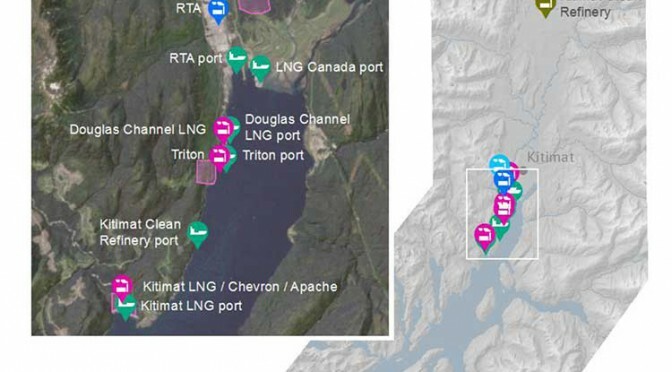 AltaGas, parent company of Pacific Northern Gas, is also involved in Triton, a floating LNG project that would be at an old log sort on Douglas Channel, the same site as the BC LNG project. A second floating liquified natural gas terminal may be planned for Kitimat, Northwest Coast Energy News has learned. 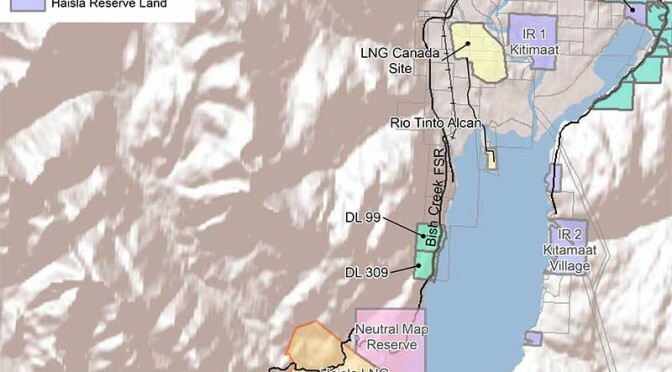 According to multiple sources in Kitimat, Altagas, the parent company of Pacific Northern Gas plans the terminal at the old log sort site on Douglas Channel, where the barge carrying the liquifaction equipment would likely be moored next door to the already planned BC LNG/Douglas Channel Partners LNG project which would be served by gas delivered by the PNG pipeline system. Pacific Northern Gas has filed an application with the BC Environmental Assessment Office to construct and operate an approximately 525 kilometre, 610 millimetre (24 inch) diameter natural gas pipeline from the natural gas hub at Summit Lake, near Prince George, to Kitimat that would loop or twin the existing PNG existing natural gas pipeline. 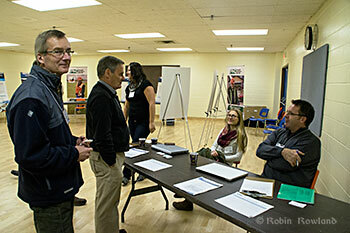 On Tuesday, November 26, Pacific Northern Gas held a sparsely attended open house at Tamitik Arena as part of the BCEAO public comment procedure. A 38 day public comment period on the application information requirements started on November 25 and will end on January 2, 2014. At the open house, PNG officials explained that “looping” means that there would be a second or twin pipeline that would mostly be on a parallel route to the existing pipeline. Since both pipelines would begin at the Summit Lake terminal and end at the Kitimat terminal that is where the term “looping” comes in. 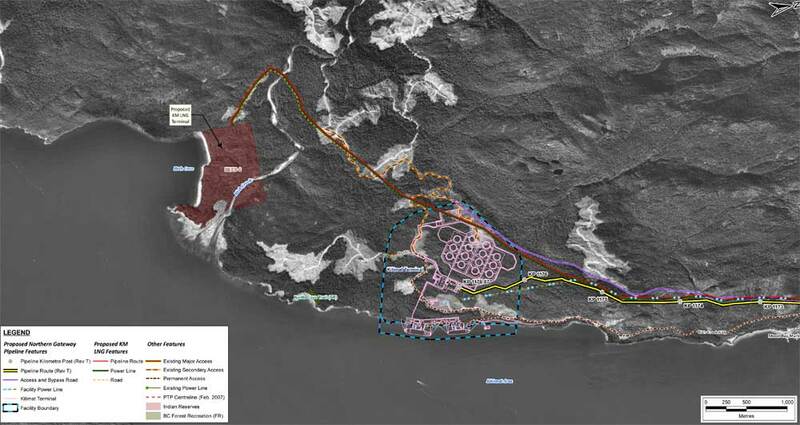 The PNG officials said that the pipeline was initially designed to service the first floating LNG terminal at the old log sort site on Douglas Channel south of Kitimat, but north of the KM LNG site at Bish Cove. Unlike the bigger project Kitimat LNG or KM LNG, a partnership between Chevron and Apache (and according to reports possibly Sinopec) or the Shell-led partnership LNG Canada, the BC LNG project would allow smaller companies to provide LNG to Asian customers. 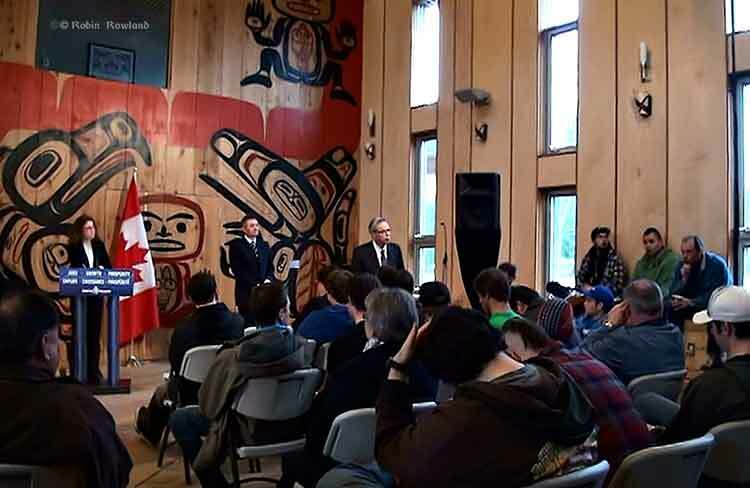 At the open house, the PNG officials said the two pipelines could also service “another Kitimat floating LNG project” but declined to give details for confidentiality reasons. The same officials also said the proponent of that project was also looking at Prince Rupert as a possible site for the second floating terminal. 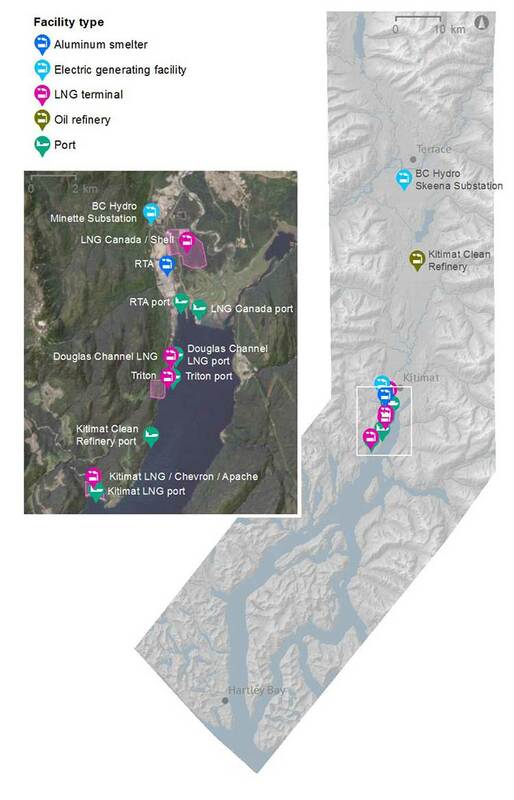 Kitimat sources have confirmed that AltaGas has told them that the company is also considering Prince Rupert as a site for a floating LNG terminal. 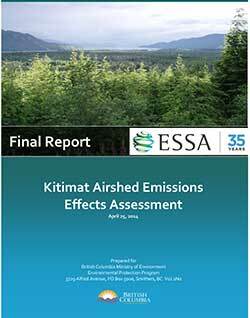 However, the current documentation and maps filed with the BCEAO show the PNG looping pipeline terminating at Kitimat, not Prince Rupert. 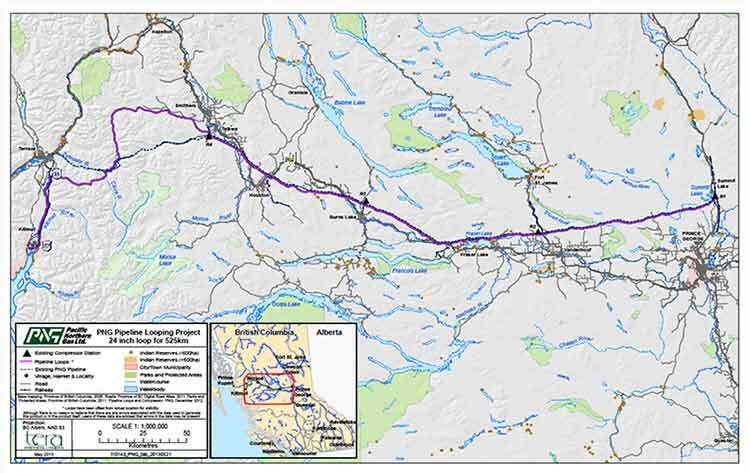 According to the maps filed with the BCEAO and made available at the open house, the new pipeline would not be twinned completely along the existing route across the mountains west of Smithers to Terrace, but would head north at Telkwa parallel to Highway 16 before making its own way through the mountains, crossing the existing pipeline at the Zymoetz River east of Terrace and then taking a westerly route toward Lakelese Lake before joining the existing pipeline corridor along Highway 37. AltaGas took over Pacific Northern Gas in the fall of 2011. The Texas-based arm of Douglas Channel Energy partnership, LNG Partners, is currently in financial difficulty. Reports say that the Texas investors in the company are having difficulty repaying a $22.5 million loan from China’s ENN Group. 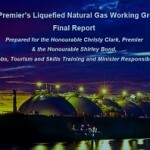 The problems currently faced by the Texas group have no affect, at this point, on the Haisla Nation investment in the BC LNG Energy Cooperative. 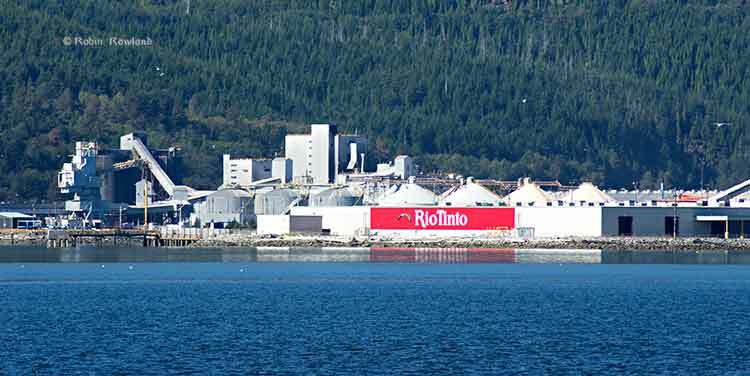 There is already speculation in Kitimat that if the LNG Partners get into further financial difficulty, AltaGas may step in and take over. The would raise the question whether or not there would still be two floating LNG terminals on Douglas Channel, or just the one, as originally planned, but under new ownership. The Project will generate approximately 1800-2400 direct person years of employment during construction. Additionally, tax benefits will be generated for Kitimat and the regional districts crossed by the pipeline. 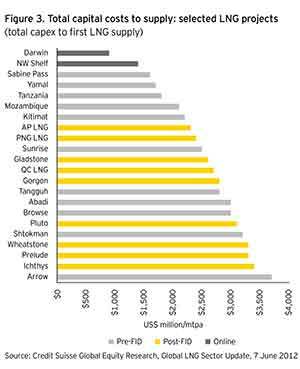 PNG anticipates the project will also result in a significant reduction in natural gas transportation rates for its existing customers. Natural gas transportation costs are a major issue in the northwest, for those costs appear to keep going up while the price of natural gas in North America is generally going down. Natural gas transportation costs in Kitimat spiked after the closure of the Methanex plant and have continued to be quite high, which is just one of the increasing burdens for residents of Kitimat on fixed or low incomes, who are not benefiting as others from the current boom town economy. Another problem facing PNG is that the new pipeline will cross the traditional territory of the Wet’suwet’en First Nation, where one house, the Unist’ot’en oppose both the Northern Gateway and Pacific Trails Pipeline and have set up a blockade camp on access roads. The PNG filing with the BCEAO promises consultation with both the Wet’suwet’en Council, and the Office of the Wet’suwet’en, which represents the hereditary chiefs and matriarchs, as well as other First Nations along the proposed route. 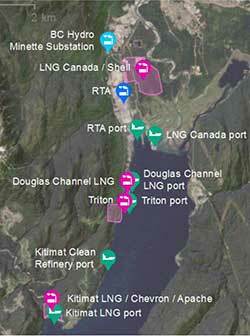 Bermuda-based Golar LNG has confirmed that it has signed a finalized contract for both feed gas supply and LNG purchase and off-take for train #1 of the Douglas Channel LNG Project, the smallest of the three (so far) proposed LNG projects in Kitimat. The contract award for LNG purchase and off-take was made jointly to Golar and LNG Partners, LLC (Houston, TX) (“LNG Partners”) and the contract award for feed gas supply was made to LNG Partners. 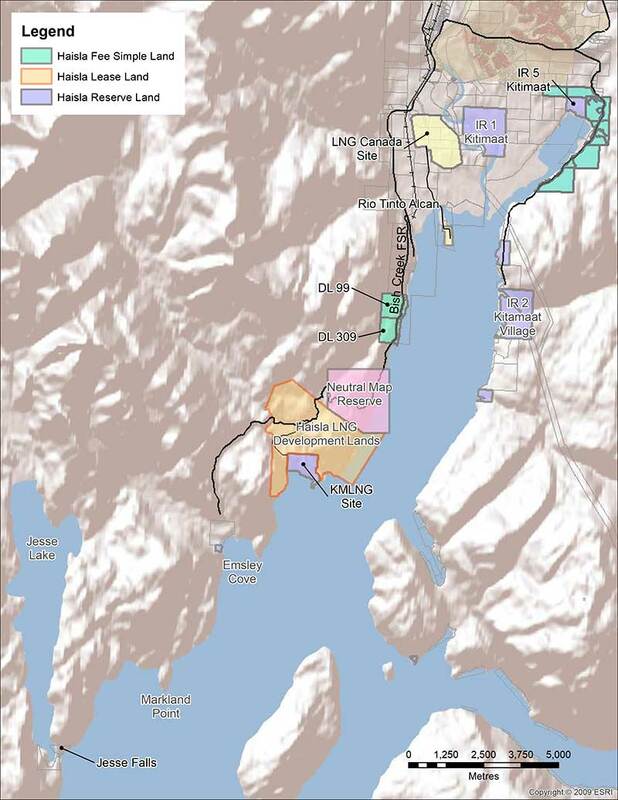 The DC Project is being jointly developed by the Haisla Nation and Douglas Channel Gas Services Ltd and is expected to produce approximately 700,000 metric tonnes per annum of liquefied natural gas from the initial planned production facility beginning in the second quarter of 2015. Golar’s participation in the project and its commitment to the LNG off-take remains subject to the Company reaching agreement with the current proponents of the DC Project for financing of the facilities, and receipt of all permits required for the project to proceed on a firm basis. 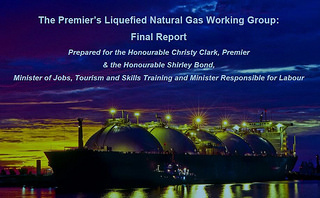 At the meeting of District of Kitimat Council on Jan. 21, 2013, Mayor Joanne Mongahan said that the BC LNG – Golar deal would mean enough business to fill about one LNG tanker each month. 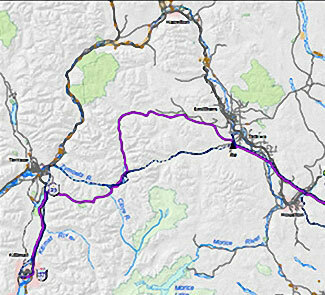 That volume of gas can be transported over the existing Pacific Northern Gas pipeline, Monaghan said.